Check out some awesome teenage bedroom ideas for girls and boys. They will help you design a perfect bedroom for your kid. Nowadays, life of teenagers have changed when compared to past. The teenagers of today have their say in everything around them. Things are no different when it comes to designing their bedroom. They like to be in a comfortable set up when it comes to relaxation. Create an eye-catching accent wall; paint the wall behind the bed in green and white color. Use these teenage bedroom ideas to give an artistic tinge to the room. The white bed and the side tables offer a cool look and lots of storage space. This is a beautiful bedroom! 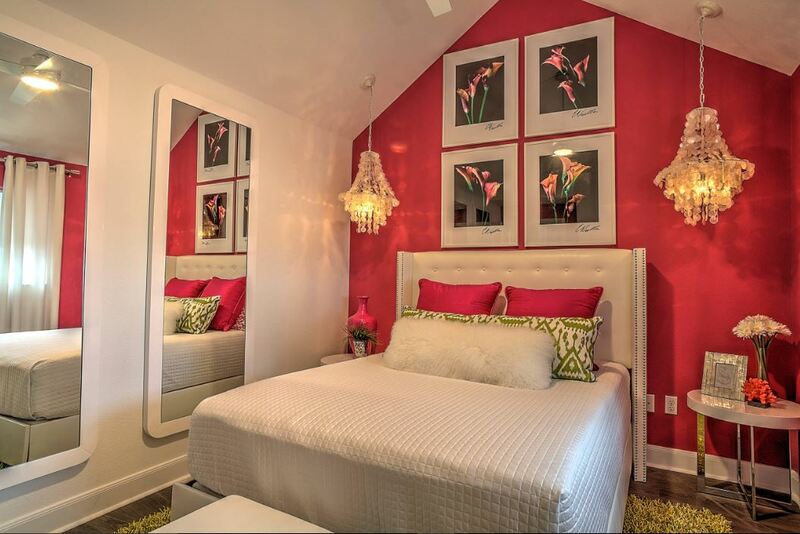 The entire bedroom is done in vibrant pink, the color which speaks about care, compassion and love. The canopy bed has a seating arrangement around it which is a unique feature. The chair and the lamp give a vintage feel to the bedroom. Choose these contemporary teenage bedroom ideas. This one has a perfect mix of colours – pink, white and green. Add a couple mirrors on the wall to make the room look more spacious. The idea of slanting ceiling is awesome. Lovely chandeliers, photo frames and other accessories add to its opulence. An ideal teenage bedroom! Go for metallic silver wallpaper to create this interesting look. The dark flooring in contrast to the white walls certainly took to my fancy. The headboard in yellow amidst everything white and blue is striking enough. What a gorgeous and cozy looking bedroom! The first thing that turned me on was the multicolored rug which actually explains the vibrant mind of a teenager. The corner seating adds to the coziness of the room. The sleek fireplace is very attractive and the color scheme adds to the softness of the room. This is the kind of bedroom which I would dream of for my little princess. The round bed with pink and green curtains is the cutest bed ever seen. The shape of the carpet is very interesting and the lighting arrangement is exotic. 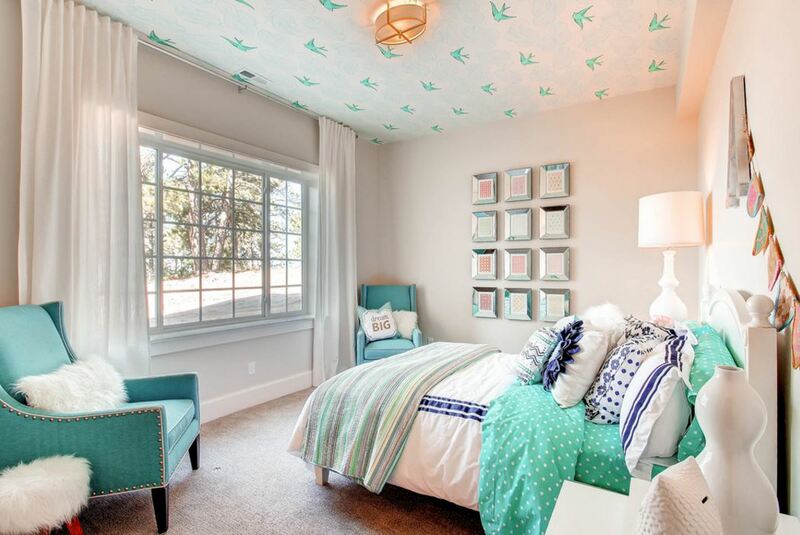 Pick a few teenage bedroom ideas for your angel before doing up her room. The sea green wall color creates a serene environment in here. 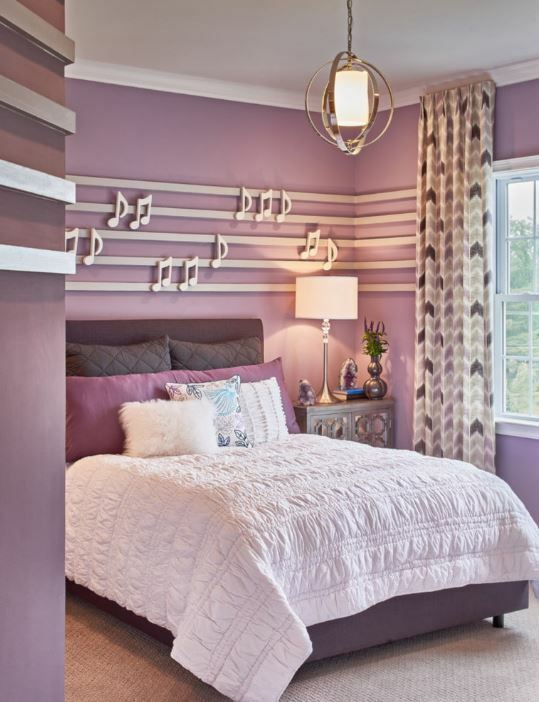 Chain art wall accent add an unexpected chic to this teen space. The bookshelves on the either side make room for the books, photographs and other decorative items. The bed too has got ample storage capacity. This is an example of a typical girls dream room. The patterns on the wall are quite interesting. The concept of build in shelves and drawers around the window seat carries an element of novelty. 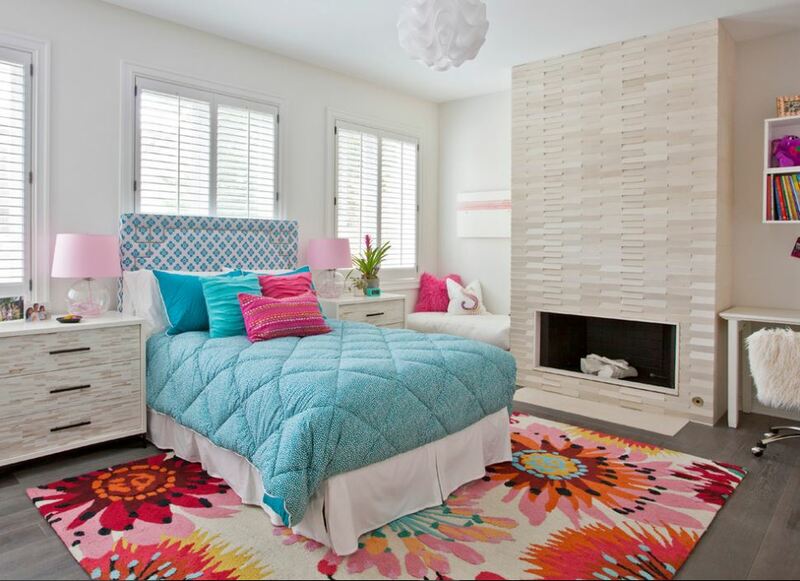 Use of bold color and pattern adds beauty to the whole idea of teenage bedroom arrangement. Go for these creative teenage bedroom ideas. Instead of a wall papered accent wall go for the ceiling. Add big windows to your kid’s room as this makes the room big and more open. The photo frame decor on the wall looks awesome. 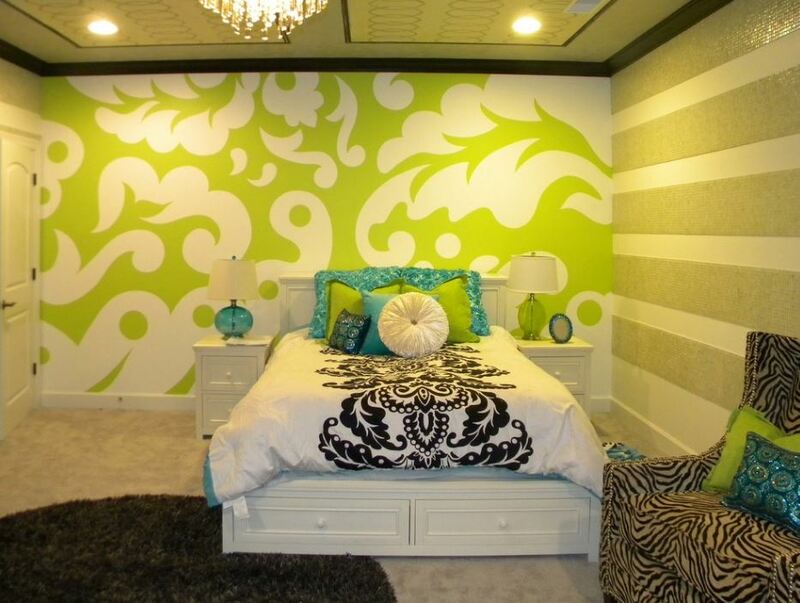 Love the use of green in this pretty teen girl’s bedroom design. I love the musical notes on the wall. It helps in contributing to the musical theme of the room. The lavender wall color adds uniqueness to the concept. The color in itself is associated with feminity and grace and the ambience of the room satisfies the idea. These smart teenage bedroom ideas have been carved out keeping in view the mindset of a teenage boy. Boys at this age like to be free and these bedroom designs might help them to stay at home and connected for hours. 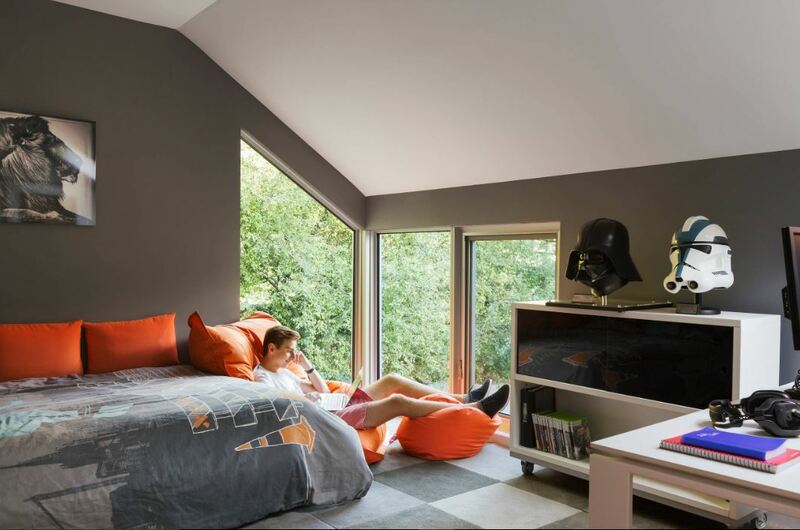 Here are some very smart and simple teenage boy bedroom ideas. 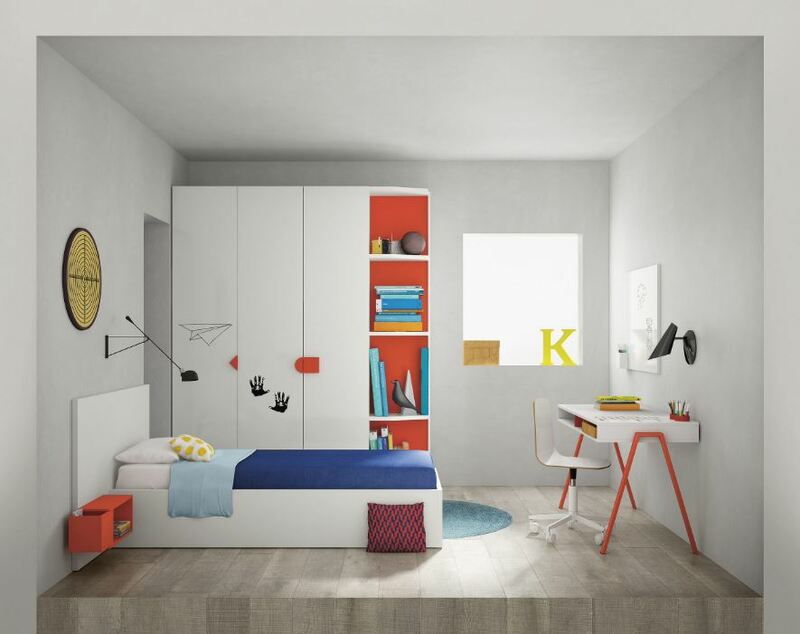 This bedroom has a mix of various colors and what intrigues me the most is the letter ‘K’. The splashes of orange add to the uniqueness. 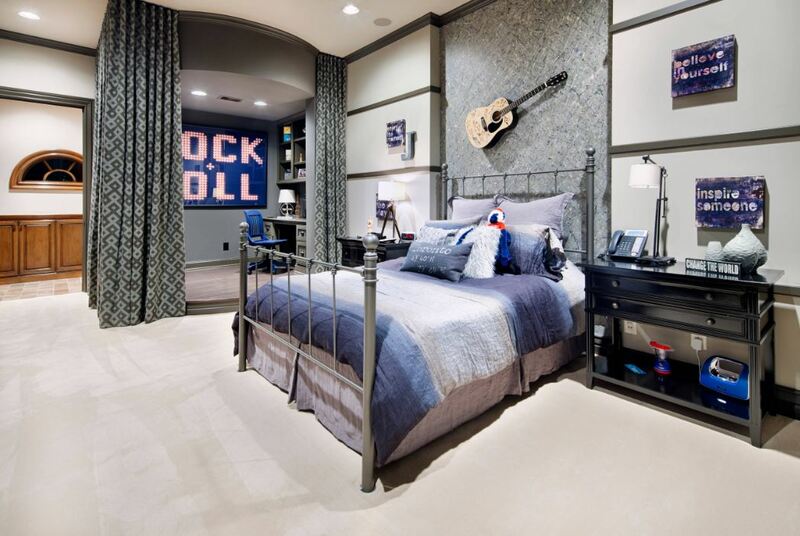 A ‘rock and roll’ teenage boy bedroom idea! This room is self-sufficient enough to hold the boy’s interest to spend more time at home. The idea of the curtain separating the room is awesome. The atmosphere speaks about compatibility of personality and mood of the occupant. The idea of the headboard in this teenage boy’s room is very attractive. Complementing with the vibrant hues of the headboard, the various colors have been splashed throughout the room. The room looks beautiful. 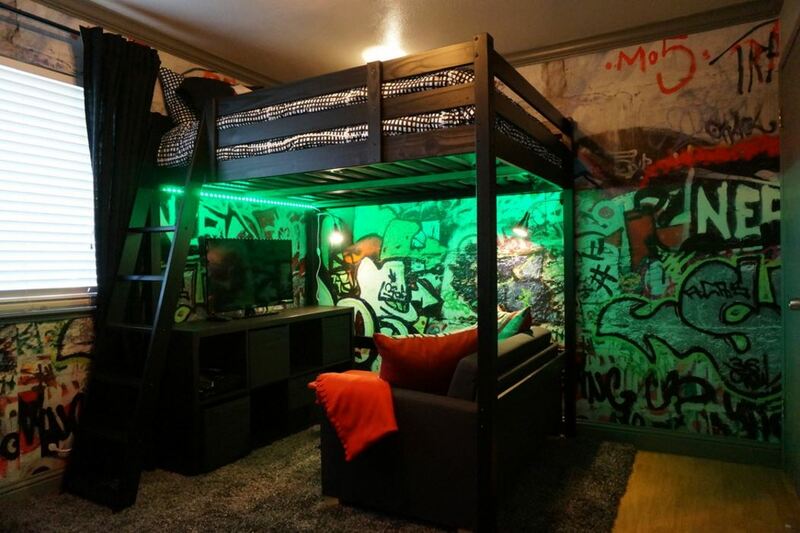 This teenage boy’s bedroom idea exemplifies’ out of the box thinking’. Look at the color scheme in shades of grey! The motifs on the cushions, the painting and the decor on the wall, each and every little detail in the room is fascinating and interesting. 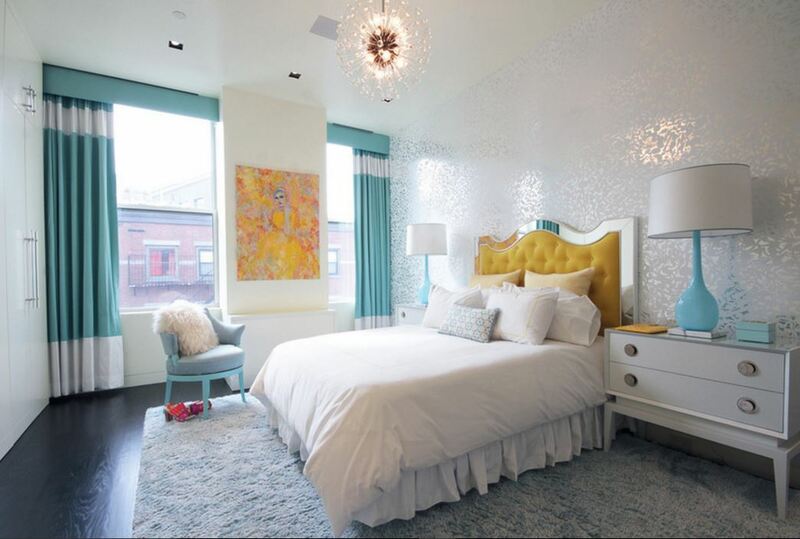 The bedroom is a riot of colors loosely spread all over, giving an artistic touch to the room. The graffiti art is the most interesting and unique feature and is sure to attract complements. 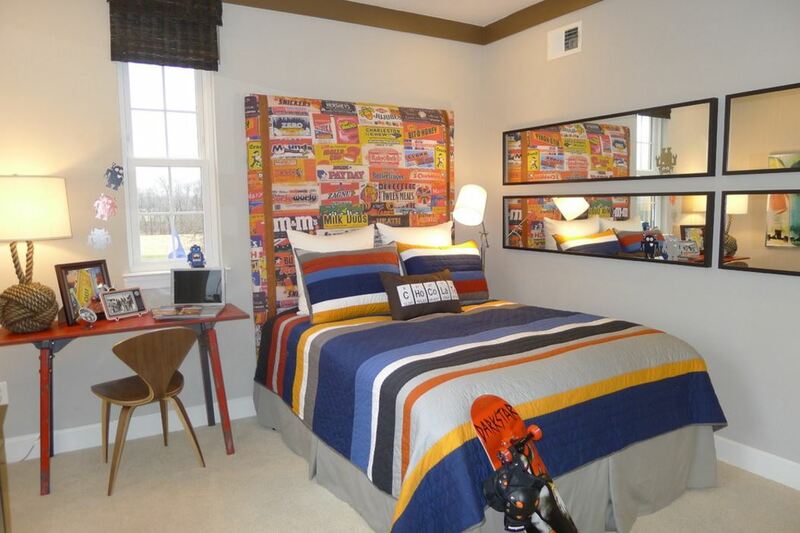 The mural on the wall has been given a vibrant touch to this teen bedroom. The chair and the clock look like they have been teleported right from the future. The beautiful combination of grey, blue and white is quite enticing. 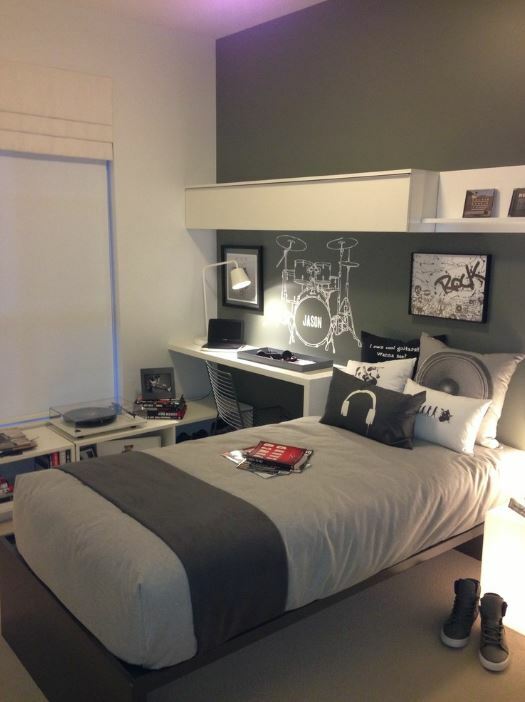 A smart teenage boy bedroom design! 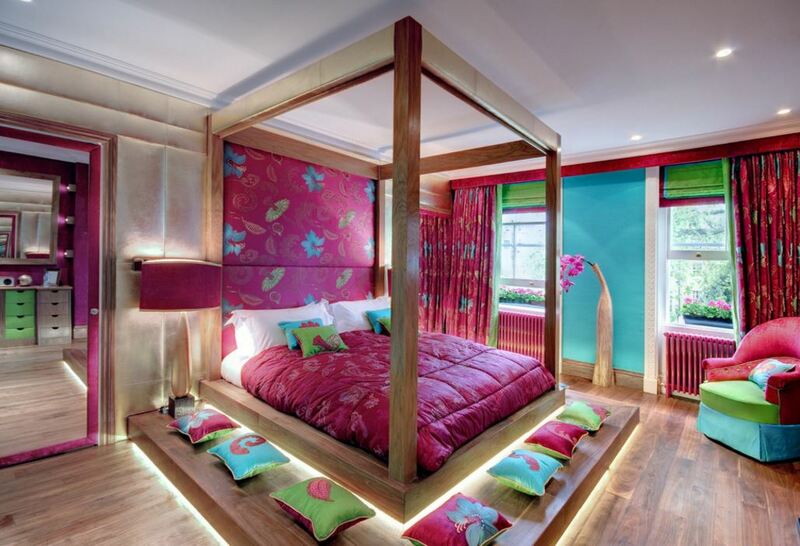 This bedroom features movable furniture which can be quite useful. The huge windows with the seating arrangement beside it are quite conducive for avid readers. The splashes of orange add brightness to the room. Go for some very modern and contemporary teenage bedroom ideas and concept! 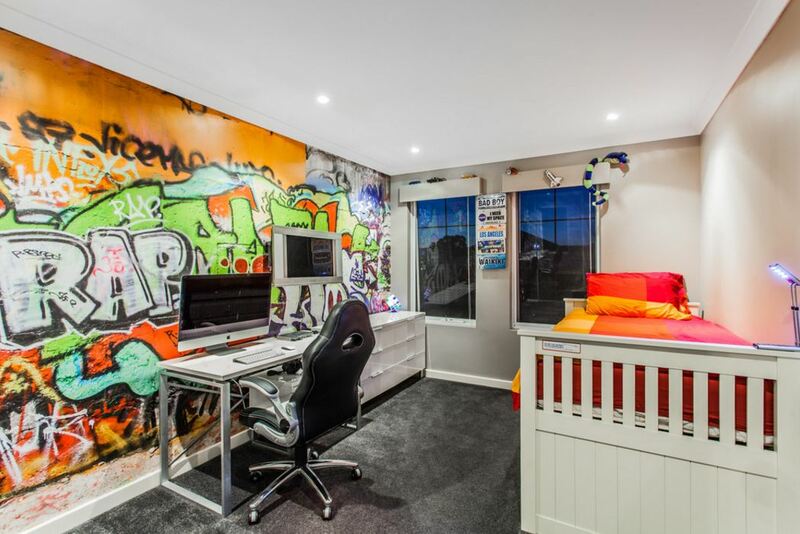 The painting on the wall is very interesting giving this kids bedroom an urban touch. The textured wooden flooring is quite attractive. Check out these teenage bedroom ideas. The all wood furniture in this room pulls one back to nature. This bedroom has lots of storage areas. The design of the side table is perhaps a new concept. The maple color duvet rings in peace in the atmosphere. The entire concept of this teenage bedroom is quite intriguing. The bunk bed with the seating area underneath is very interesting and eye-catching. The graffiti art on the wall is capable enough to turn gaping eyes on. This entry was posted in Kids Room, Kids Room Designs and tagged Bedroom Decorating Ideas, Teen Bedroom Ideas, Teenage Bedroom, Teenage Bedroom Decor, Teenage Bedroom Decor Ideas, Teenage Bedroom Decoration, Teenage Bedroom Decoration Ideas, Teenage Bedroom Design, Teenage Bedroom Designs, Teenage Bedroom Furniture, Teenage Bedroom Idea, Teenage Bedroom Ideas, Teenage Bedroom Ideas Boy, Teenage Bedroom Ideas Cheap, Teenage Bedroom Ideas for Boys, Teenage Bedroom Ideas for Girls, Teenage Bedroom Ideas for Small Rooms, Teenage Bedroom Ideas for Small Spaces, Teenage Bedroom Ideas Girl, Teenage Bedroom Ideas Pictures, Teenage Bedroom Interior Design, Teenage Bedroom Interior Design Ideas, Teenage Bedroom Paint Ideas by Preeti Sinha. Bookmark the permalink.